Jason’s decision set off a series of events and adventures in my own life, which most recently took to me to the Black Rock Desert in northern Nevada. Burning Man was my own experience, but I still paid homage to its origin in my life. 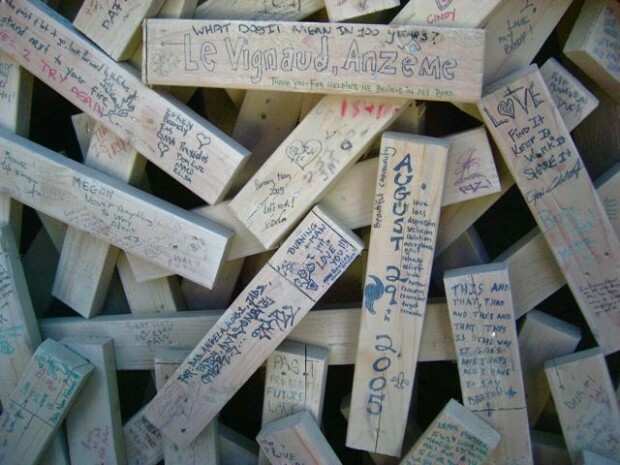 One of the first things I did after arriving to Burning Man was walk over to the giant wooden effigy and leave my mark in Le Vignaud Blue. Nearly a week later, after the Man was just a pile of burning and smoldering ashes I threw in a 200 year old piece of oak, taken from an old roof beam in Le Vignaud. At first I wasn’t sure why I put this memorial at the Man instead of the Temple. I think it’s because although Jason’s role in Le Vignaud may soon be at an end, the village itself and the few people living there will keep on truckin’. And who knows, maybe being burned with the Man as a symbol of rebirth will prove to be a bit of good luck for the little commune.